Well, I goofed! I totally thought I shared this at the end of October, but it looks like it slipped away from me! Here it is now, add in the words whenever you see fit. Really, they can be learned any month, they colors are just fall related. 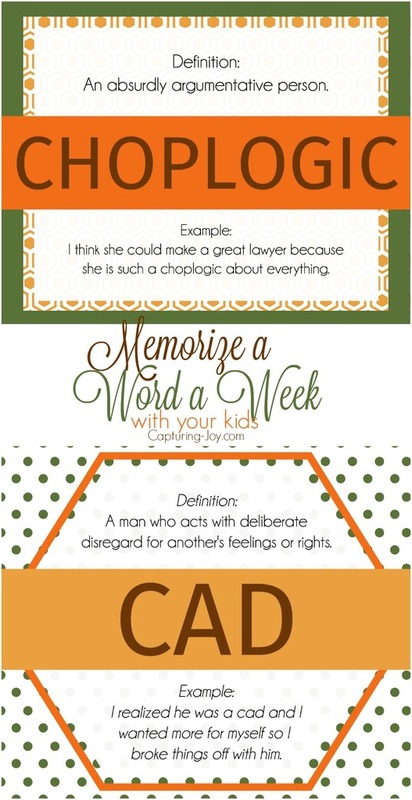 All year long, I’ve shared 5 words each month to Memorize a work a week with your kids, and I’ve had GREAT feedback that families are having fun out there learning together, being creative using the new words in their vocabulary with each other. Not only is it fun, but it boosts confidence in kids to learn/know BIG and odd words like this.